The Disney World Files: Giveaway! 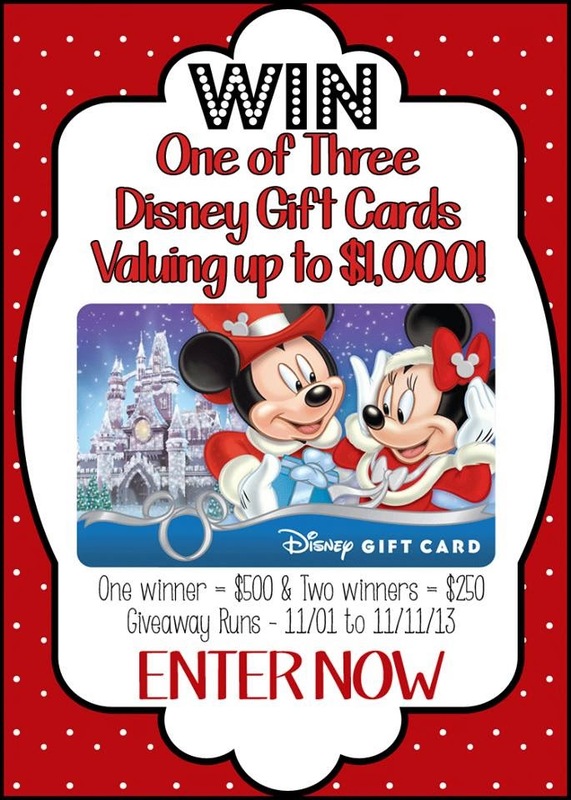 $1000 in Disney Gift Cards Starts November 1st! And you thought the giveaway from September/October was big? Just in time for the holiday season, I’ve teamed up with an amazing group of other Disney bloggers and sites to co-sponsor this spectacular giveaway for $1000 worth of Disney gift cards! One grand prize winner will receive a $500 Disney gift card, and two runners-up will receive a $250 Disney gift card each. Just think of all the wonderful Disney things you could get with those...or how much of your next Disney trip would be taken care of if you’re one of the lucky winners! Here’s the details: The giveaway starts Friday, November 1, 2013 at midnight and runs through Monday, November 11, 2013 at 11:59pm. It is open to people in the United States only who are 18 years old or older. Each regular entry (liking a Facebook page, following on Twitter, etc) will be worth two entries into the giveaway; sharing or tweeting about the contest will be worth five entries each. If you complete all the entries, including all the tweets/shares, you could earn 354 chances to win! Winners will be notified by email once the giveaway ends and will have 24 hours to reply to claim their prize.